When the first Portuguese merchants and missionaries reached Japan in 1543, the warriors they encountered were armed with steel swords that were equal to, or better than, any being produced in Europe. The blades of those lethal weapons, they soon discovered, didn’t start life as iron-ore rocks like European steel, but as heaps of fine black grains called satetsu. It took lots of flowing water to wash the grains out from lighter-colored granite sand dug from hillsides or high riverbanks. The iron-rich powder was then smelted in charcoal-fueled furnaces on the way to becoming a superb type of steel known as tamagane. I doubt very much whether any foreigner would have been allowed to witness that process back in those days, because the making of iron and steel had been clouded in mystery ever since the first sword wielded in Japan was said to have been cut from the tail of an eight-headed serpentine monster by Susanoo, the rambunctious storm god of summer. However, if you watch Hayao Miyazaki’s superb, and meticulously researched, 1997 animation film, “Princess Mononoke,” you’ll get a good idea how tamagane steel was made. Around the world, the Iron Age dawned at different times in different places, and in these isles the metal first began to be made during the Yayoi Period (200 B.C. to A.D. 250). That was when the archipelago was colonized by people from the Asian mainland who also brought with them, among other things, intensive wet-rice farming. It was these well-armed folk who introduced iron- and steel-making to Japan using charcoal-fueled clay furnaces and foot-operated bellows without which it would have been impossible to achieve and sustain the high temperatures needed to smelt iron. Long afterward, even when Western methods of mass-producing iron and steel had taken over, those ancient tatara furnaces were still being used to make tamagane steel for the finest swords right into the middle of the 20th century, when most of them fell into disuse. Then, in 1977, that traditional method was revived following the formation of the Japanese Society for the Preservation of Japanese Art Swords, and with the cooperation of the Agency for Cultural Affairs and the Hitachi Steel Co. in Shimane Prefecture. At present, the only town in Japan where a tatara furnace is used is Okuizumo in Shimane Prefecture, where it is normally operated in winter at the Yasugi works of Hitachi Steel. In the smelting process, which takes 72 hours, some 12 to 13 tons of charcoal is used to transform 10 tons of satetsu iron sand into 2½ tons of iron in the form of an amorphous mass known as kera. This lump is then dragged away and cooled by immersing it in water before it can be reheated and beaten into steel — but to get at the kera, the clay tatara has to be broken down. Hence after every smelting, the boat-shaped furnace needs to be remade by hand. The master in charge of the smelting at Hitachi Steel’s plant is an amazing gentleman named Murage Kihara, a former local sumo champion. 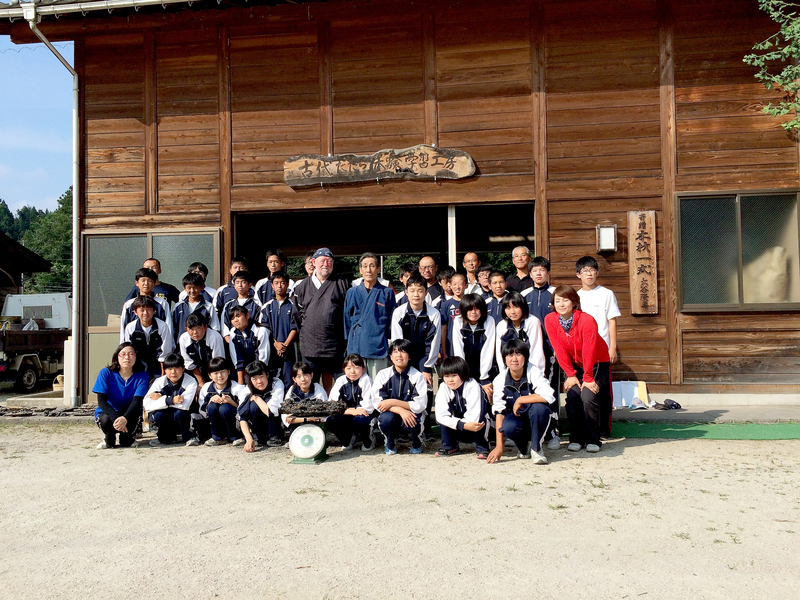 Now aged 80, he not only passes on the way of making tamagane sword-grade steel to colleagues, but he also introduces local children to the methods and to the rituals associated with this uniquely Japanese tradition. In this country, where most buildings used to be made of wood, and many still are, people generally don’t want children to having anything to do with fire. Over the past 40 or so years, though, I have always argued that being able to light a safe fire for cooking, light and warmth is an essential part of survival training. So you can imagine my delight when the Broadcasting System of San-in, Inc., which serves Shimane and neighboring Tottori Prefecture, asked me to take part in a television documentary about school students making tamagane steel. 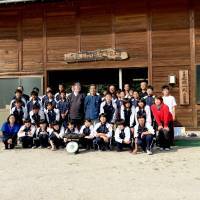 Several weeks ago, in August, I joined 31 students, both boys and girls, from Yokota Middle School in Okuizumo to make steel under Mr. Kihara’s supervision. 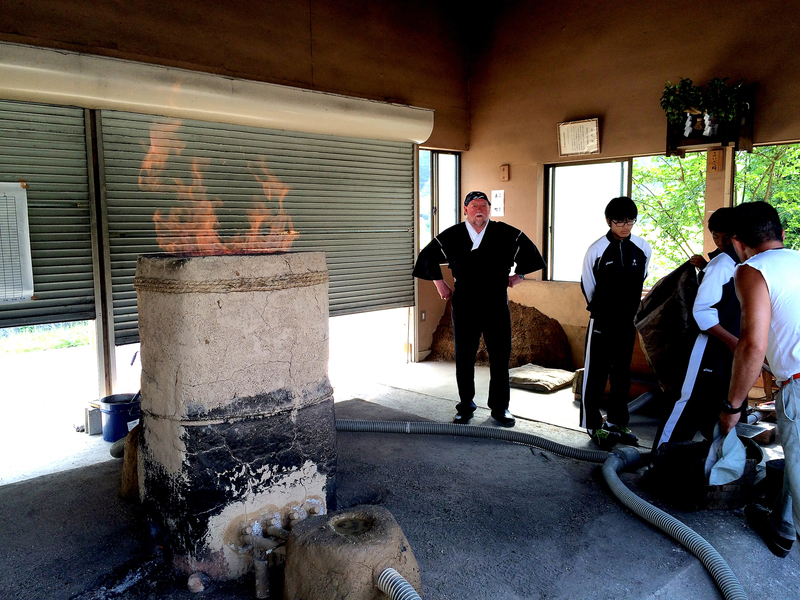 The students spent the first day building a small tatara furnace about 150 centimeters high that was made in just the same way as the big ones by molding wet clay by hand into brick-sized lumps and slapping them down onto each other to form the walls. From the next morning, the students took turns all day sweating over the handoperated bellows to keep the fire blazing at around a searing 1,400 degrees Celsius. Once the first fire had been lit with well-seasoned wood, and the clay had baked hard, then charcoal, mostly from hardwoods, was added in surprisingly precise quantities. With eager students (and sometimes even a huffing, puffing Old Nic) taking turns on the bellows, a carefully measured amount of the black iron sand was scattered on top of the fiercely blazing charcoal, sending all manner of sparks and multi-colored flames into the air. 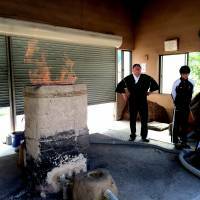 This process was repeated throughout the day, with all the students getting their turn to add either charcoal or iron sand before a small hole was finally poked into the bottom of the furnace, allowing molten waste slag known as noro to slowly pour out. Students were keeping a record of the temperatures inside the furnace, but in the old days the iron masters would have judged the heat from the color of the flames. I was very impressed with the students. This was a hot summer’s day and they were working from early in the morning until the evening around a fiery furnace. Nobody complained, although inwardly I wished it could have been cold beer that I was swigging instead of water and green tea. However, my manager and I gained brownie points when we slipped off to a shop and returned bearing two cartons full of ice cream and ice lollies. As you can imagine, they were very much welcomed by students and teachers alike. Finally, Mr. Kihara signaled that it was time to quit pumping the bellows and to begin carefully breaking down the clay furnace with iron bars and hooks. Then the mother-iron kera mass left glowing among the remains was dragged out and dropped into a bath of water, which hissed and boiled for several minutes. Apart from the behavior and conduct of those young students, I was also impressed by what had been done over many generations to the hillsides that had been dug away to get at the precious iron sand. The mined land was not just left in a state of devastation, which would probably have been the case in Europe, North America or Australia. Instead, it had been carefully leveled and tiered to make rice paddies. It takes a huge amount of water to wash the iron grains out of the sand in the first place, so now that water is used to irrigate and flood the rice paddies, leaving little hillocks here and there where there had been old graves or tiny shrines. In addition, although the nature of the scenery had been changed from forested slopes to green rice paddies, little patches of woodland have also been planted. Indeed, the day after we made that tatara iron, Mr. Kihara took me up the mountain to look down on the wide green vista of lushly growing paddies — and he was justly proud of what his ancestors had done, and of the tradition that he himself was passing on. Titled “C.W. Nicol Nihon no Furusato Izumo no Mori o Iku” (which translates as something like “C.W. Nicol Visits the Izumo Country Home Forest”), the TV documentary will be shown in two parts in the Kansai region on Oct. 9 and 10.